This will be our last adventure and my last collection of Fall Season photos for this year. Even though the temperature is changing drastically by now, we still manage to go to Cumberland waterfalls . Driving to Kentucky is fun though , the scenery is beautiful although some leaves are starting to fall now. We did go to a short hike and check some cabins and camp sites. Definitely we will come back here on spring time for a camping. They call this Cumberland Falls as Niagara of the South. I must say this is little Niagara Falls , even though they don't have that much tourist attractions and restaurants it is still worth a trip. The trails and the camping area is perfect for a family adventure. I love how the waterfalls connected to the river that looks likOnce I was a kid out of curiosity I always wonder where the Kentucky Fried Chicken comes from? Then as I grow up I became aware to State of Kentucky. But I didn't know that's where it started. One day my husband brings me to Corbin City. Corbin is one of the few cities in Kentucky, the population was 1,779 at the 2010 census. 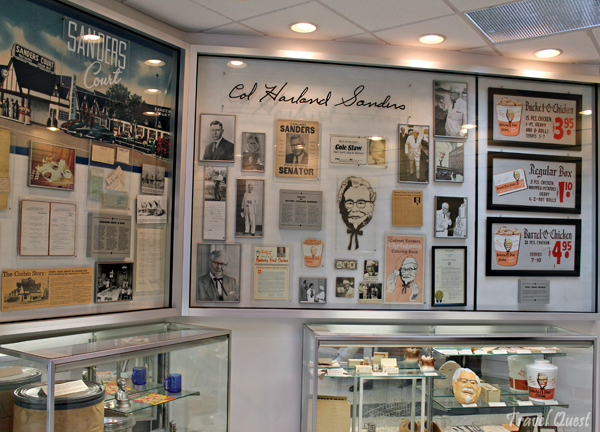 We went to the Harland Sanders Café and Museum, the restaurant where Colonel Harland Sanders developed the fried chicken recipe that would later become famous as Kentucky Fried Chicken. The museum and the mark of history. In 1932 Colonel Harland Sanders bought the small restaurant near this site. 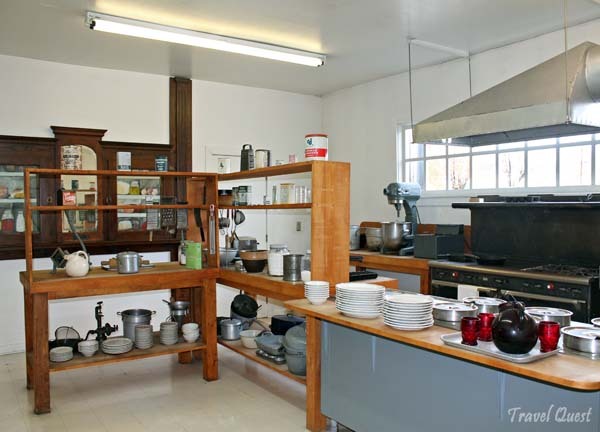 Here he combined good cooking, hard work, and showmanship to build regional fame for his fine food. 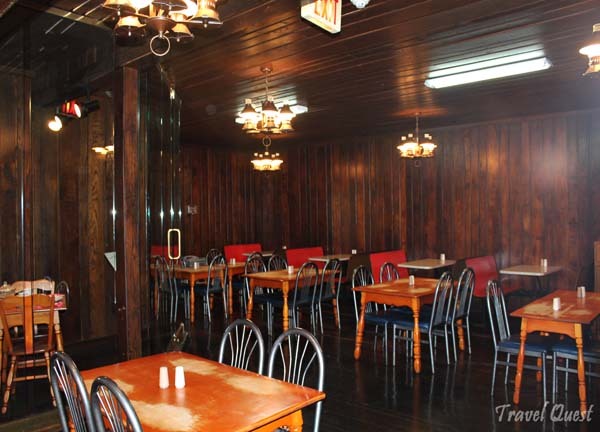 His restaurant and motel, now gone, flourished. 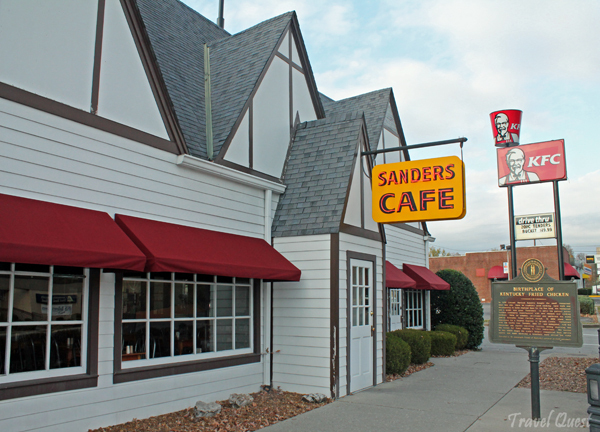 To serve his patrons better Sanders constantly experimented with new recipes and cooking methods. 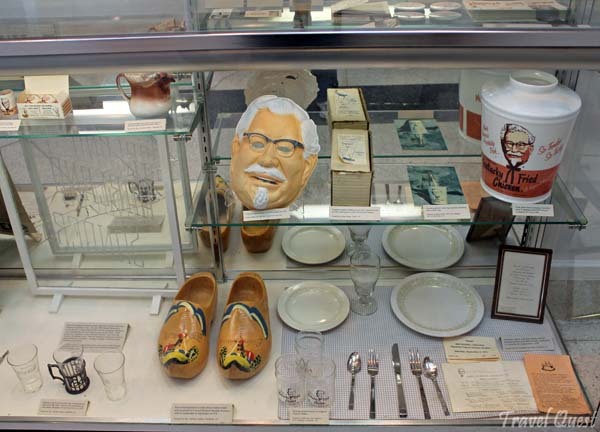 Here he created, developed, and perfected his world famous Kentucky Fried Chicken recipe. In 1956 plans were announced for a Federal highway to by-pass Corbin. 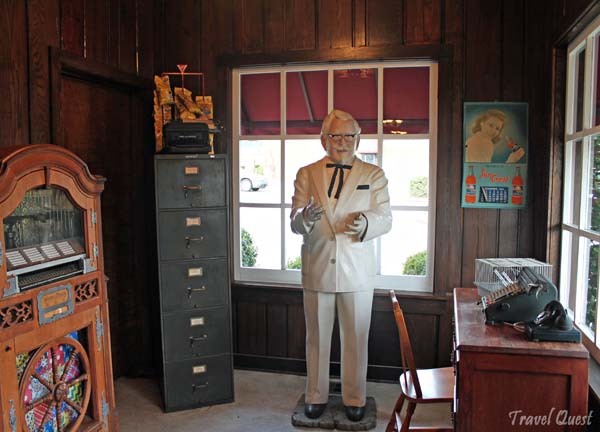 Threatened with the traffic loss, then 66 and undaunted, sold the restaurant and started traveling America and selling seasoning, and his recipe for fried chicken to other restaurants. His success in this effort began the world's largest commercial food service system and made Kentucky a household word around the world. 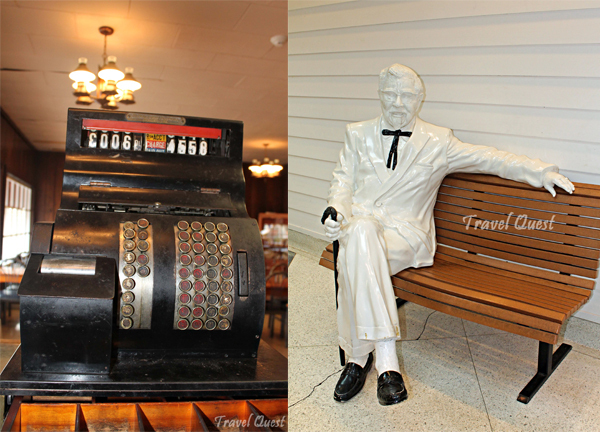 Colonel Sanders continued to travel up to 250,000 miles a year visiting KFC restaurants around the world until his death in 1980 at the age of 90. 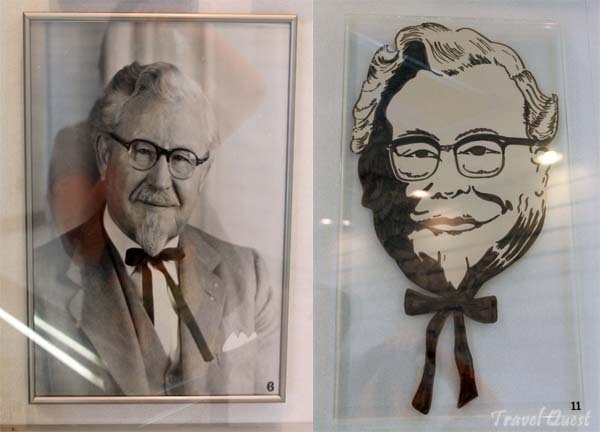 Mr. Sanders (on the left) and the famous KFC logo (on the right). 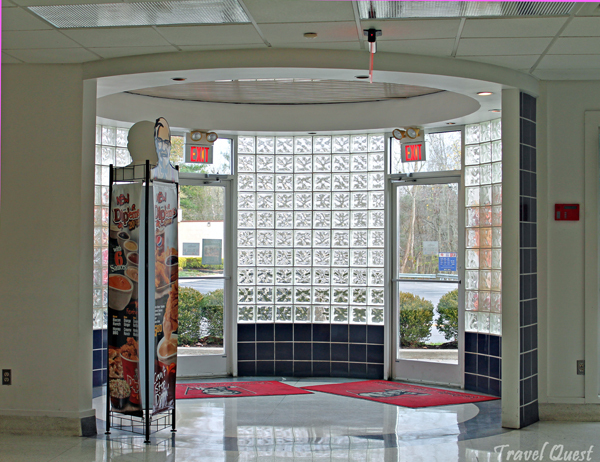 Entrance door of the restaurant. Thanks Miss Leah for sharing this. Now I know kung saan nagmula ang ever popular na Kentucky fried chicken haha. Minsan lang napapansin ko, sa bawat branch ng KFC iba-iba ung consistency ng gravy nila. minsan may sobrang thick, minsan naman ang labnaw lols. He he oo nga iba iba minsan ang texture ng gravy nila, pero fav ko ung sinasabaw ung gravy sa kanin I know I'm weird ha ha! oh, so this is where it all began! Dyan pala nagmula ang KFC. Thanks for sharing sis. Informative. Gustong gusto ko ang chicken sa KFC. Thank you for sharing this information. Now I know where it came from. I love KFC! I lveo all the pictures too, parang naka tour na din ako. Wala pala dyang KFC? dito sis marami kaso di nag seserve ng rice he he.. puro mashed potato and bread. I love KFC. Thanks for sharing the info. Oh wow cool place to visit. I just do not go to KFC though. Thank you so much for writing this great story as well as sharing your photos with us! I love KFC! Their classic fried chicken is amazing, don't you think so? Everyone loves chicken :) Being honest, I'm too busy to cook after moving in to a new flat and when my family wanted to find quick, but at the same time delicious food, KFC came crossed our minds right away.